Close Encounters is an experimental curatorial project initiated by the Hyde Park Art Center and in collaboration with a number of other major cultural institutions in Chicago. 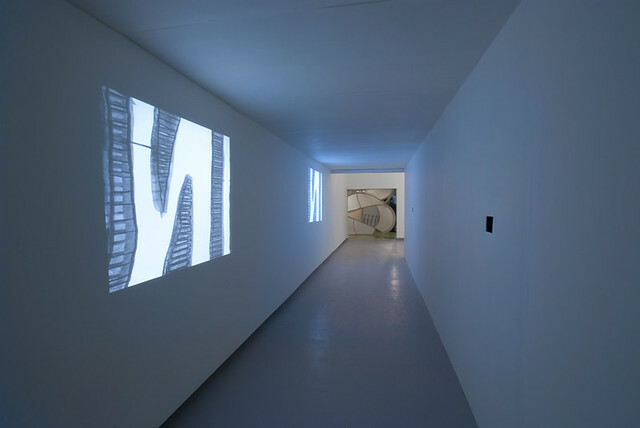 It provided nine leading New Zealand and U.S. artists with a series of shared experiences related to the nature of community in a variety of Chicago settings in May 2008. The most important of these experiences included a traditional Māori gathering, called a hui, facilitated by Māori elders in the Field Museum’s Māori meeting house Ruatepupuke II and a Powwow conducted by tribal leaders at the American Indian Center. In addition, the group visited twelve other communities around the city. The artists were then asked to create new works generated by this experience for the Hyde Park Art Center. Five of the resulting commissions are currently on exhibit at the Center. They are works by Daniel du Bern (NZ), Tania Bruguera (US), Juan Angel Chavez (US), Walter Hood (US), Truman Lowe (US), and Wayne Youle (NZ). Two other commissions will be presented at the Center by Maddie Leach (NZ) in October 2010, and Lisa Reihana (NZ) in 2011. The current set of commissions is striking for the rich variety of the artists’ responses. Bruguera’s performance interrupts the exhibition opening to simulate how bureaucratic order interferes with societal belonging. In Gallery One, Chavez and Lowe reference natural elements – smoke in the case of one and water the other – as either a shared passage or a common understanding that can unite disparate people through experience. Also in Gallery One, Youle and Hood investigate the complex concerns of multi-cultural societies. Youle specifically assesses U.S. iconography and his own random experiences in Chicago from the perspective of an outsider. Hood deals with the freedom of appropriation versus the politically correct desire for respectful use of sacred traditions. Located throughout the second floor, du Bern, in collaboration with some forty of his peers, have created an installation that bases itself upon the notion that it is impossible to stand outside of oneself, and ones surroundings, when considering what is community. Works in the exhibition range from performative and accumulative pieces through to large sculptural interventions and digital media. 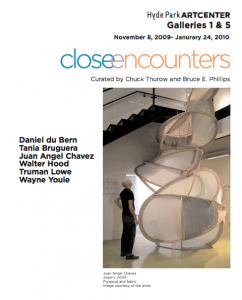 Close Encounters is curated by Chuck Thurow, Executive Director of Hyde Park Art Center, and Bruce E. Phillips, an independent curator from New Zealand.